Do you like watching cooking shows on the telly? We do. It’s our guilty pleasure. The only thing is we usually end up watching them right after dinner, and even though I’m totally full, after a few minutes salivating over the screen, I’m hungry all over again! What’s with that?! Anyway, a few weeks ago, it was National Fudge Day and I had made some of my Fantastic Fudge not that I need an excuse to make that fudge because it’s that good. 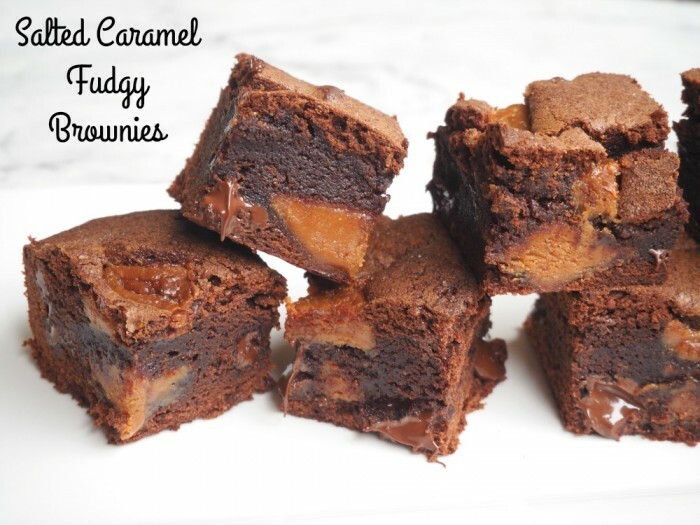 Anyway, call it cooking kismet or whatever, but that night we were watching Donna Hay’s new show, Basics to Brilliance and she made some Salted Caramel Brownies with value added caramel fudge (although Donna’s was shop bought…) and they looked epic. 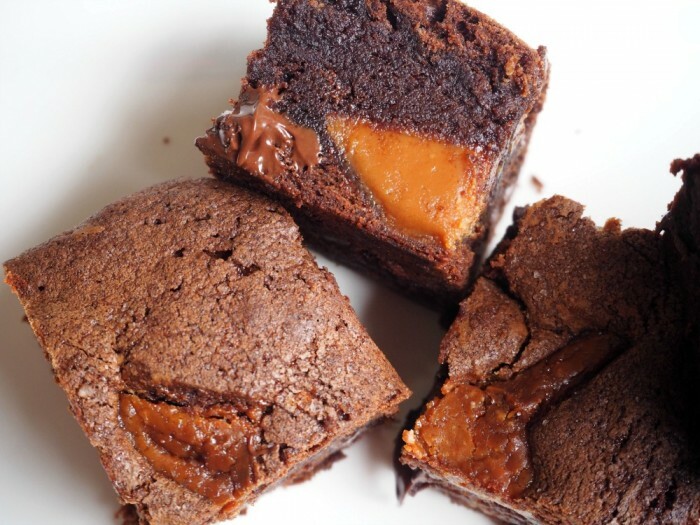 Of course, I had to convert them to the Thermomix and make them my own because a) I’m a bit obsessed with brownies right now and b) I do believe that salted caramel and fudgy brownies are a match made in Dessert Heaven. 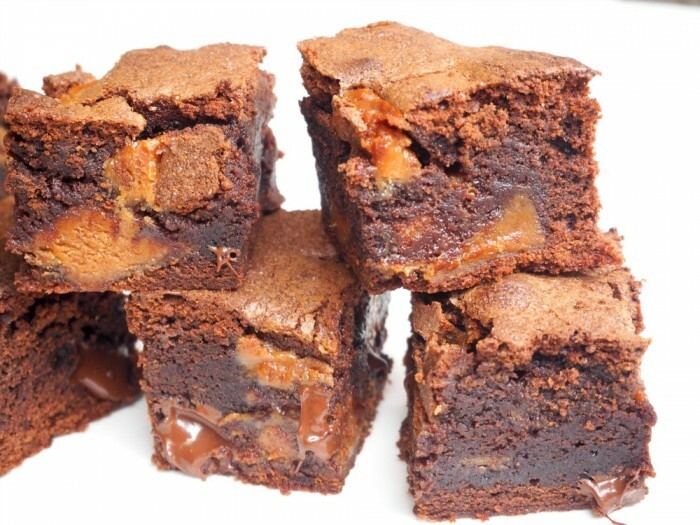 There’s a few factors that take these brownies to the next level. One is the two sugars, the caster sugar for the sweetness and the brown sugar for the gooeyness. Another is fudge. Now I use my own, and I highly recommend you make a batch too, so you can stuff some in the brownies now and then enjoy the “surplus” later… But store bought will work too. 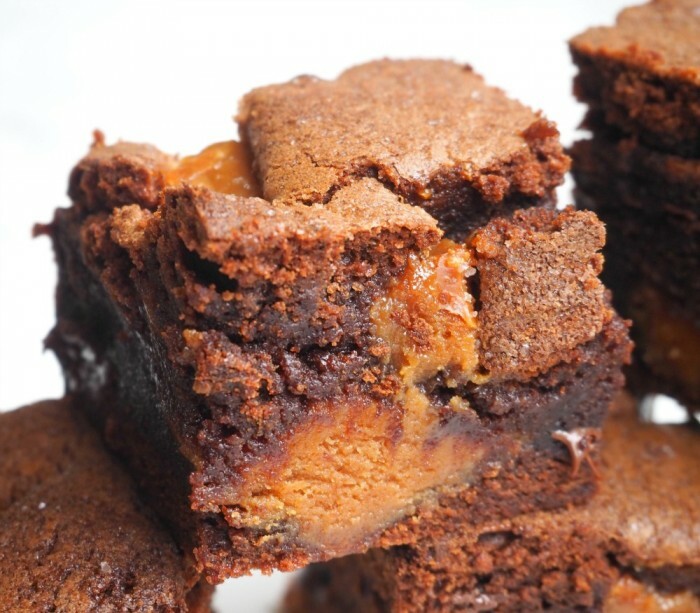 And let’s not forget the molten gooeyness of these babies, the trick is not to overcook the brownies unless of course, you like bricks for brownies. Let’s get stuck in, shall we?! Preheat oven to 180 C / 160C fan-forced. Grease a deep 20cm square tin and line with baking paper. Melt the butter in a small pan or in microwave and then remove from heat. Allow to cool slightly. Place the flour, cocoa, sugars, melted butter, vanilla and eggs in a large bowl. Mix until smooth. Add the dark chocolate chunks and 100g fudge and fold through the mixture. Spread mixture into prepared tin and level the top. Gently press the remaining fudge into the brownie mixture. 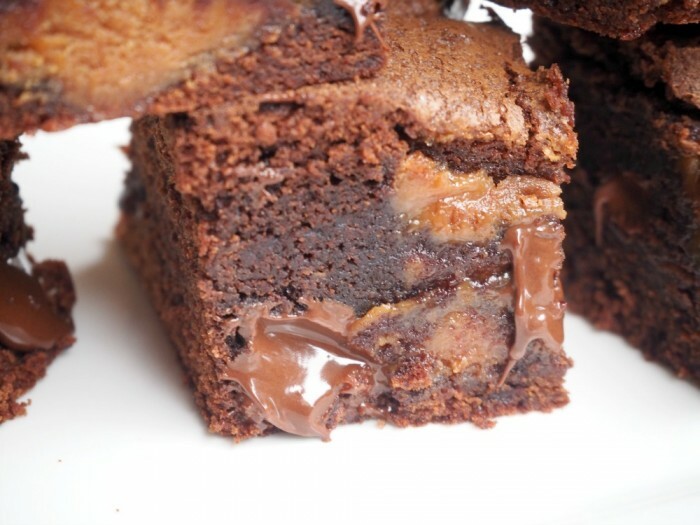 Avoid putting the fudge too close to the edge so that it doesn’t catch and burn. Sprinkle with the salt. Bake for about 30 minutes until there is a dull crust and the sides are coming away from the edge of the tin. Allow to cool in the tin for about 5 minutes before slicing into squares and serving warm, or allow to cool completely in the tin. Preheat oven to 180C /160C fan forced. Grease a deep 20cm square tin and line with baking paper. Mill the raw sugar for 10 seconds on speed 9. Set aside. Add the butter into the TM bowl and melt for 5 minutes on speed 2 at 60 degrees. Check that the mixture is melted and allow to cool slightly. Add the flour, sugar, cocoa, eggs and vanilla and mix for 10 seconds on speed 4. Add the dark chocolate chunks and mix for 10 seconds on reverse speed 2. Stir through 100g fudge chunks and mix for 10 seconds on reverse speed 3 using the spatula to assist. Bake for about 30-35 minutes until there is a dull crust and the sides are coming away from the edge of the tin.